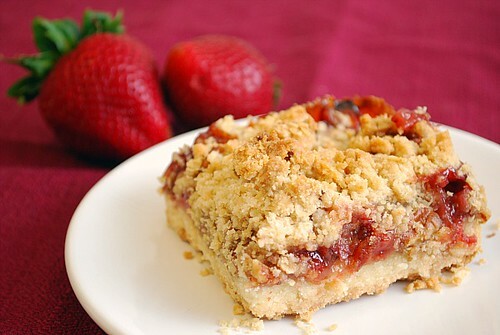 Article first published as Strawberry Streusel Bars on Blogcritics. Although strawberry picking season here in the midwest is over, that doesn't mean I can't take advantage of the strawberries that are continuously growing out in the west! I definitely do my best to eat locally whenever possible but this time of year, I'm a sucker for strawberries. I recently purchased a few pounds of strawberries on sale and was so excited to try some recipes. One recipe was for these Strawberry Streusel Bars. 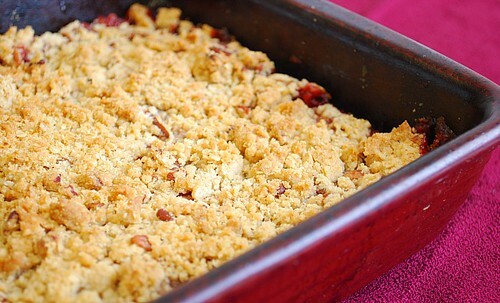 These bars have a buttery crust, fruity strawberry layer and a crumbly, nutty topping. They're not too sweet and perfect for either breakfast or a sweet snack any time of day. Using a combination of jarred strawberry preserves and fresh strawberries, these bars are chock full of strawberries. I love the buttery crust which can hold it's own without crumbling. The crust mixture is also used for the topping and when baked, it comes out crunchy and nutty, allowing the pecans to shine through. If you're not a strawberry fan, you can probably use other fruits as well including blueberries, raspberries, or even blackberries! In a large mixing bowl beat butter and granulated sugar with an electric mixer on medium speed until combined, scraping sides of bowl occasionally. Beat in eggs. Beat in as much flour as you can with the mixer. Stir in any remaining flour and the pecans (mixture will be crumbly). Set aside 2 cups of the pecan mixture. Press the remaining pecan mixture into the bottom of an ungreased 13x9x2-inch baking pan. In a medium bowl, combine the preserves and fresh strawberries. Spread the mixture to within 1/2 inch of the edges of the crust. Sprinkle reserved pecan mixture on top of preserves mixture. Bake in a 350 degree F oven about 45 minutes or until top is golden brown. Cool in pan on a wire rack. Cut into bars. Makes 48 bars. Mmm fruit bars are great for the summer! I'm a sucker for strawberries too and try to eat as many of them as possible when they are in season. These bars look wonderful. Hi Procrastobaker! Sorry about that - I used 1 cup preserves & 1 cup chopped fresh fruit. The recipe has been updated to reflect it. Enjoy! Yeah, the good news and bad news of strawberries... Just when we get hooked, the price doubles. Especially in kansas (south of you where every berry is getting burned up right now... But sweet corn is coming in now, so i will survive (me and Gloria). Appreciate the tip on using the jam. makes this fast and easy and love anything with a pecan crust! Wow, great recipe! I am in the midwest as well and that still doesn't prevent me from buying up strawberries! Fantastic! Can't wait to try them. I've also been obsessed with strawberries lately! I don't include nuts in my desserts due to intestinal issues. Is there something that could be substituted for the nut ingredient? Hi Diana, you could substitute the pecans for oatmeal instead.